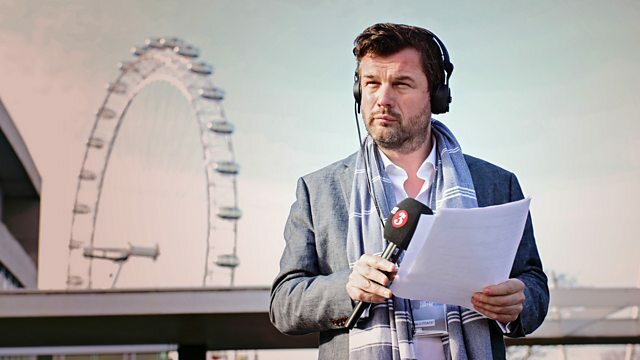 Petroc Trelawny presents Radio 3's breakfast show live from London's Southbank Centre, with the Best of British Music Playlist, compiled from listener requests. Live at Southbank Centre: Petroc Trelawny presents Radio 3's classical breakfast show, featuring the Best of British music Playlist, compiled from listener requests. Also, including your requests for works by neglected composers, amateur music-making groups and wake-up calls. Email 3Breakfast@bbc.co.uk with your music requests. Radio 3 is broadcasting live from a pop-up studio at London's Southbank Centre all day every day for the last two weeks of March. If you're in the area, visit the Radio 3 studio and performance space in the Royal Festival Hall Riverside Café to listen to Radio 3, ask questions and enjoy the special events. Ensemble: Guildhall String Ensemble. Director: Robert Salter. Pachelbel/Vivaldi/Handel/Haydn: Strings: Guildhall String Ensemble. Performer: Luiza Borac. Ensemble: Academy of St Martin in the Fields. Conductor: Jaime Martín. The Film Music of Erich Wolfgang Korngold: BBC Phil / Gamba. Choir: Concerto Vocale de Leipzig. Ensemble: Ensemble Baroque de Limoges. Conductor: Christophe Coin. Performer: Wilhelm Kempff. Music Arranger: Wilhelm Kempff. J.S. Bach: Englische Suite Nr.3; Capriccio BWV 992 - Transkriptionen fur Klavier. Orchestra: Hallé. Conductor: John Barbirolli. Grieg - Norweigan Dances; Lyric Suite etc..
Buxtehude: The Complete Organ Works - 4. Satie: The magic of Satie: Jean-Yves Thibaudet. Performer: Julian Bream. Ensemble: Melos Ensemble. Conductor: Malcolm Arnold. Sir Malcolm Arnold - The Collection. Sir Thomas Beecham Conducts Orchestral Favourites. Bowen: Complete works for viola and piano: Power/Crawford-Phillips. Conductor: Lorin Maazel. Orchestra: Pittsburgh Symphony Orchestra. Sibelius: Symphony No.3 etc: Pittsburgh Symphony Orchestra/Maazel. Soler 13 Sonatas; Boccherini 'Fandango'. Performer: Tasmin Little. Performer: John Lenehan. Music Arranger: Fritz Kreisler. Tchaikovskiana: Tasmin LIttle, John Lenehan. The Organ Music of Alfred Hollins. Singer: Simon Keenlyside. Orchestra: Münchner Rundfunkorchester. Conductor: Ulf Schirmer. Simon Keenlyside: Tales of Opera. Scott Joplin: Piano Music: Phillip Dyson. Orchestra: Orchestre national de France. Conductor: Charles Dutoit. Poulenc: Concert Champetre; Sinfonietta, etc.. Performer: Andreas Scholl. Performer: Tamar Halperin. Performer: Mstislav Leopoldovich Rostropovich. Orchestra: Academy of St Martin in the Fields. Director: Mstislav Leopoldovich Rostropovich.